When I received this book I sighed. Why had I agreed to read another Amish book? 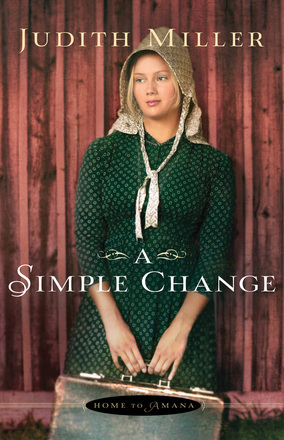 But A Simple Change by Judith Miller is not about the Amish at all. Instead it is set in 1881 in the Amana Colonies, a Pietist communal settlement in Iowa. Yes, communal as in shared meals, assigned work, shared homes, and loving, caring people. In A Simple Change, Jancey decides to leave Kansas City and move to the Amana Colonies with her parents. Her ill mother longs to spend her dying months where she grew up, and Jancey wants to care for her. Leaving the orphans she teaches is very difficult, but she finds it surprisingly easy to leave Nathan who has been courting her. Of course, no one can replace her beloved orphans, but Jancey soon meets little Madelyn who has trouble reading. Teaching a group of little girls in the presence of Madelyn’s older brother Ritt brings joy to her evenings even though her mother is failing. However, although the evenings are pleasant, the days are spent cleaning the men’s quarters of the outside workers with Sister Margaret. Here Jancey struggles with the colony’s rules and her own good sense, and soon discovers that the simple life can be very complicated and that not all people are what they seem to be. To top it all off, Nathan arrives from Kansas City, determined to stay until he has convinced Jancey to marry him…. This sweet novel is peopled with good, godly characters but Jancey also faces some thoroughly nasty villains. Despite the mystery of the men’s quarters, she is learning to be at peace in the Amana Colonies and her ties to the outward world slowly fade, just like her dear mother is fading. I really enjoyed living in the Colonies with Jancey, but kept on shaking my head over her impulsive decisions. (Aren’t we all tempted to those?) Although Jancey’s mother is dying, her kind and perceptive words give the young woman what she needs to understand herself and the young men in her life. Although I did not expect to, I thoroughly enjoyed A Simple Change. Once again, Judith Miller has written a gripping and uplifting novel. This sounds interesting largely for the setting. I grew up in Iowa and still regularly visit family there — and eat at the restaurants at the Amana Colonies. They disbanded the communal aspect some time in the early part of the 20th century, but they maintain some of the history and buildings (the restaurants are former dining halls). It’s one of Iowa’s main tourist spots. That is so cool! I’d love to visit the colonies after reading these books.